Ever since the holidays, I’ve diverted from my healthy eating habits, indulging in more sweets and heavier dishes. Well, it’s a new year, so I’m going to try to go back to my healthy ways. 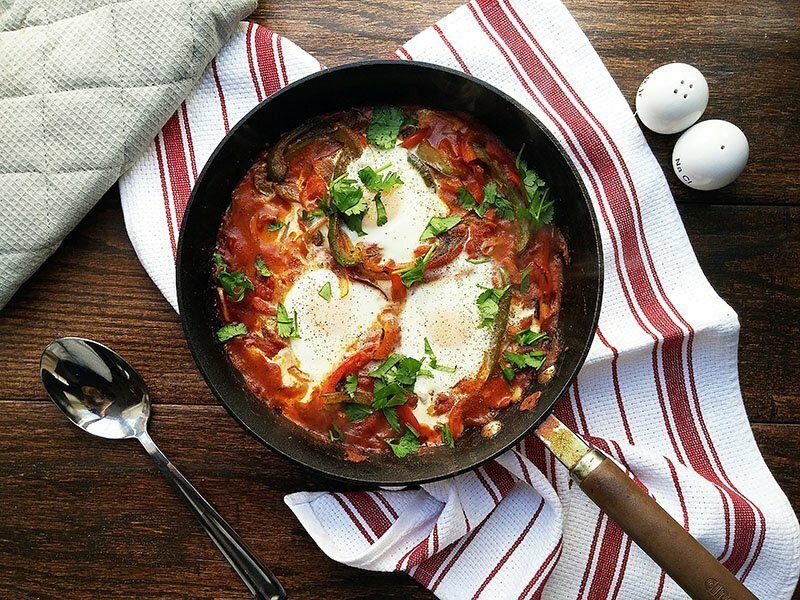 For breakfast today, I’m serving a Tunisian dish called shakshouka with runny eggs and feta cheese. Healthy and satisfying! Heat oil in cast iron pan or saute pan over medium-high heat. Add onions and peppers and saute until vegetables have softened, about 5 minutes. Add onion and seasonings (cumin - red chili flakes.) Season with salt and pepper and let cook 1 minute. Add tomatoes and water, gently mashing the tomatoes. Cover, reduce heat to medium-low and cook for 20 minutes. Remove lid and simmer for another 10 minutes to slightly thicken the liquid. Crack eggs directly into the tomato and pepper sauce, spacing them evenly. Crumble feta on top and finish in the oven for 12-15 minutes or until egg whites are set but still runny. Remove from the oven, sprinkle freshly ground pepper and chopped cilantro. Serve hot. 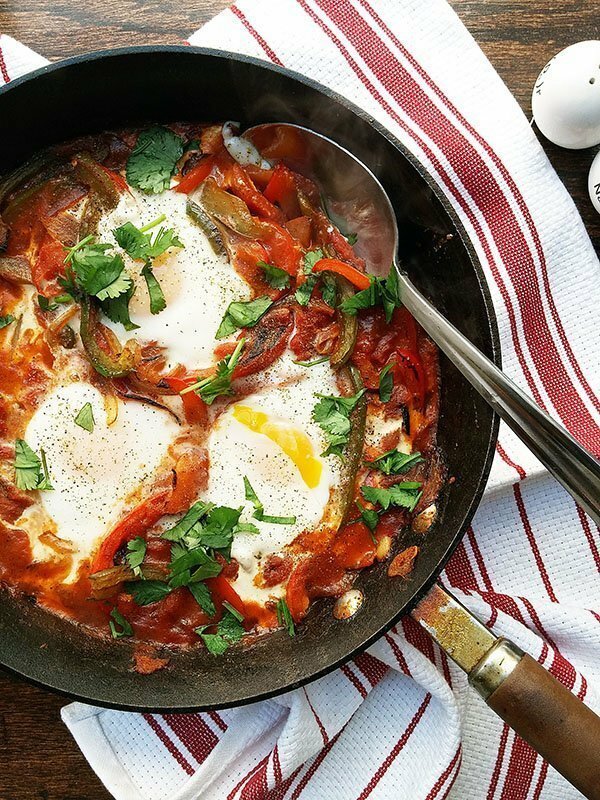 Shakshouka is a traditional dish enjoyed by Tunisians, Moroccans, Libyans, and Algerians. It’s basically a dish consisting of poached eggs in a tomato sauce, but there are many different variations out there. This dish is actually very simple to put together so there aren’t many tips to add other than when you are cracking the eggs on the tomato sauce, make little wells in the sauce. This way, the egg yolk will stay in place. Also, keep an eye on your eggs when you are baking the shakshouka. I accidentally left mine in too long and the eggs were a bit overcooked, sadly. If you want to serve individual portions, serve in ramekins or ovenproof dishes. You can also garnish with freshly chopped parsley instead of the cilantro and sprinkle with freshly grated parmesan. This dish reminds me of an Italian dish, or more specifically, pasta. I enjoyed mine with some toasted challah. Next time I wouldn’t mind chopping up a jalapeno and adding it to the sauce for some heat. Simple but healthy and filling! 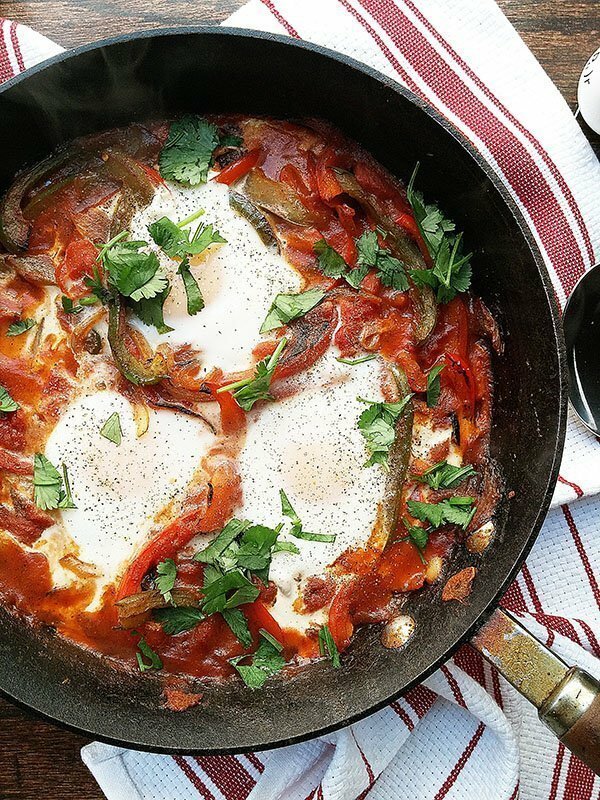 I've been seeing a lot of shakshouka recipes around lately but nobody ever talked about what kind of cuisine it was. I had no idea it was Tunisian. Looks delicious! I always love doing a little research on a dish, makes it more interesting! Thanks for stopping by!